It was my partners birthday last weekend (12th November – 13th) where he turned the big twenty three! How I wish I could be twenty three again….I’m twenty five now and I literally feel like my younger years are coming to an end. Anyways, N had no idea I had planned a surprise weekend trip to Taupo for his birthday. I finished work early last Friday so I could quickly drive home and pack my bags. He’s a builder so he finishes work early on Fridays, I just had to quickly get home before him so I could surprise him! When he came home, he got a surprise to find me just lying on our bed instead of at work like he thought I was! If you’re ever heading over to New Zealand and have a bit of time on your hands, defiantly try and experience Lake Taupo in the North Island. It’s approximately 3 ½ hours drive from Auckland and 4 ½ hours drive from Wellington. It’s the largest lake in New Zealand and is roughly just a size smaller than Singapore! It’s the crater of one of the largest volcanic eruptions of the last 5000 years and is now one of the most popular tourist destinations. People from around the world come here to hike the Tongariro Alpine Crossing which takes you across active volcanoes and past the green-blue lakes. If you’re into a bit of adventure, there’s sky-diving, white-water rafting, jet boating and other walks you can go on in Taupo. The best time to go is in the Summer so you can do all the adventure sports the city has on offer (between December and Feb), otherwise Winter is more suited if you love to ski and snowboard as Mount Ruapehu is only a 1 ½ hour drive from the city center. Since it’s November, the weather wasn’t that great…Saturday was forecasted for rain and so was Sunday! It rained on the drive up to Taupo and on the Saturday, but on Sunday it was pretty fine all day apart from the occasional cold breeze. The nearest town to Motuoapa is Turangi (two-ra-ngee) so we weren’t exactly in the middle of no where. Tourists and New Zealanders usually stay in or around Turangi in the Winter time as it’s close to Mount Ruapehu and there’s a ski field up there for yearly snow-sports. About an hour into our drive, we stopped off in a small town called Levin and grabbed some McDonald’s as N was pretty hungry. We took turns driving and eventually made it to Motuoapa around 9pm. The batch was easy to find and is in a really nice neighborhood so I’m glad we stayed there. When we un-loaded the car, we made up the bed and sat down to watch a little bit of TV before it was off for an early night. We had to leave the house around 8am so we could fit in breakfast at Dixie Browns before our drive up to Kaitiaki Adventures in Rotorua. I’d booked us in for a day of White Water Rafting which started at 12.30pm. It was about a 2 hour drive to get there from our accommodation so that’s why we had to leave a little early. 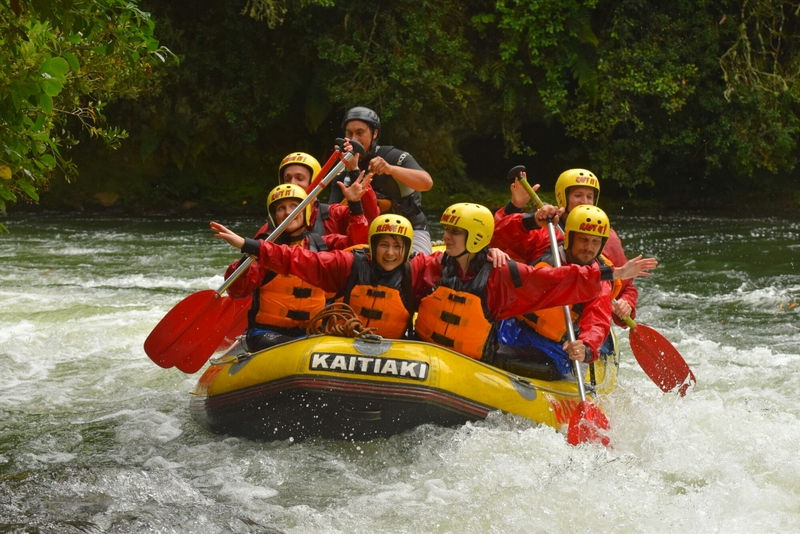 Lake Taupo did have white water rafting but I read the Rafting in Rotorua was more popular so booked that instead 🙂 Plus, I found a good deal for the both of us on a daily deal website a few months before. We were booked in for the 3 hour ‘Raft the Kaituna River’ trip. I’d read it’s great for first-timers and rafting enthusiasts and as we’d been White-Water Rafting once in Bali I thought this was perfect for us. When we arrived, we got changed into wet-suits, life-jackets, swimming booties and helmets. There were about 24 of us heading off to do the rafting so we all hopped onto the bus provided by Adventure Company and went for a 10 minute drive to the river. Once our life-jackets were checked over and the safety rules told to us, we all divided ourselves into groups of 6 and hopped into a raft with a Rafting Guide. Our guide was a guy called Drax and he was really good! If you’re ever doing the same rafting experience, try and get Drax as your guide as he’s really informative and funny. We drifted down the river and then went over some rapids. If you’ve never rafted before, this is still a cool experience as the guide tells you when to paddle and when to stop. You can’t really make a mistake. Be prepared to get pretty wet too! We went down the biggest waterfall in the world possible to do in a raft, 7 meters down! Luckily for us, the raft just went under water and we all popped back up to the surface still inside! We also did some other cool stuff like clinging onto the side of the raft while going down the rapids, riding the raft like a bull over the rapids and standing up in the raft and having a competition to see who the last person standing was. The whole Rafting experience, including getting to the river and back was around 3 hours. When we got back to the Adventure Centre, we got changed back into our clothes and then headed back to Taupo for dinner. We decided on Indian Food for dinner and I had a really yummy Butter Chicken at Master of India Restaurant. I couldn’t eat it all so N happily finished it off for me – as he does with all my meals. This was the actual day of N’s birthday so I woke him up with his present (clothes) and drove him off to Taupo for our next adventure. I’d booked us in to go on the Huka Falls jet at 10am so we didn’t quite have time to get a big breakfast. N got some Subway though as he can’t last terribly long without food. If you’ve never seen a picture or heard about Huka Falls see below! It’s an 11-meter high waterfall with around 20,000 litres of water flowing over the falls per second! You don’t have to jump onto a jet boat to see it like we did, you can drive, take a walk from Spa Park in Taupo along an easy walking track or if you’re into Mountain Biking, you can bike to it. When you go to Taupo, DO THE HUKA FALLS JET! You can’t get closer than when you’re on the boat. Our driver was really good and the Jet was really fun doing 360 turns and speeding through the water. We brought the Go Pro for this trip but as we were at the front of the jet, we didn’t get much footage apart from the front part of the boat. Even though we missed out on footage, we have the memories and the experience to look back on. Sometimes I find when I go out and do touristy things or head to events, people are far too focused on capturing the moment on their cell-phone or camera that they don’t actually enjoy the moment. I had one more activity planned for us after the Jet Ride, climbing!! There’s a place literally down the road from the Huka Falls Jet called Rock’n’Ropes and I’d paid for us to spend some time climbing some really tall logs basically haha. Even though in the pictures, the structures didn’t look that high, they WERE! We arrived and got all harnessed up, then taken to the first activity – The Formidable High Beam. I opted to go first and climbed up onto the beam then made my way across to the end. Once there, I then walked backwards and attempted to do a star jump like the instructor told me to but I couldn’t. I was too scared i’d fall! Once I was down, N went after me – after telling me I was going too slow – and proceeded to go slowly himself when he got to the top. Like I said, it looks easy until you’re doing it! Next up was The Daunting Giant Trapeze. You have to climb to the top of the pampa pole and then leap out to grab onto a Trapeze bar. Sound easy? Well, it’s not. I got to the top with the wind shaking the structure and basically kneeled on top of the pole for a good 5 minutes trying to encourage myself to stand up. Eventually I stood up and then whined for a good 5 minutes about how I didn’t think I could do it. Meanwhile, N was laughing below and the instructor sipped his cup of coffee! I knew I wouldn’t be able to jump onto the trapeze, so I did a really pathetic attempt and then got hung in the air for a few minutes. When N went on, he got it first go! With trembling hands, I went up onto the last height. 15 meters I had to climb, then basically grabbed onto a rope and got swung into the air. Funnily enough, I was more confident on this one than I was on the Trapeze. One of the Instructors helps you at the top of the swing where they make sure you’re harnessed properly, then you’ve got a 3 second count-down and either pushed or you jump yourself, into the air. We finished all of this by 12pm so we had the whole afternoon free after that! As we were meeting N’s parents and sister for dinner that night (They live about a 2 hour drive away) we browsed the shops for ages! There’s actually barely any shops in Taupo so it was a very slow browse. I tried on lots of stuff at Cotton On and bought some new PJ’s and some shorts for Summer so that took up a little bit of time. N’s parents and sister met us at the Huka Falls a short time later and I made us all get some pictures with my selfie stick! Much to N’s disgust. When it got to Dinner time, we headed down the road to Lone Star which is one of mine and N’s favorite restaurants. The meals are so big and so tasty! I always get the same thing every time I go though – the Chicken Burrito, which comes with coleslaw and rice and I always have to get a John Lee Pettimore Cocktail which is basically Kiwifruit mixed with Kiwifruit Vodka, Apple Sourz, Triple Sec and Apple juice. N got a Chicken dish called the ‘Dixie Chicken’, and as he can eat like a horse, he finished off his Sister’s meal and his Mum’s meal when they couldn’t eat any more! As N’s family had a 2 hour drive back home, we finished dinner around 8pm and said our goodbyes before heading back to our batch. The sunset was so beautiful on the drive back, I had to keep making N stop so I could take some photos on the side of the lake. That night, when we were fast asleep in bed, we were woken up by an Earthquake around 12am in the morning. I assumed since the batch was so small, maybe it was really windy and that’s why it was shaking. We quickly realized it was an Earthquake so just waited in bed for it to pass (Not quite big enough to jump out of bed for us haha) but I checked Facebook and saw on my Feed that Wellington had been struck by an even bigger 7.5 shake. A Tsunami warning was issued to the Southern Area of NZ but thankfully no Tsunami came. I kind of wish I was in Wellington for the Earthquake because since then, it’s all that has been on the news. We’ve had plenty of aftershocks since then but nothing big enough to cause more damage. What’s even worse, was on the Monday we drove back to Wellington we had torrential downpours and major flooding around Wellington. I had to take the Tuesday off work too because of the weather and I couldn’t make my way into work. The bridge near the ferry terminal collapsed in the Earthquake so one of our Ferry’s was standard in the harbor for quite a few hours on the Monday Morning. 2 people actually died from the quake down in Kaikoura (the south Island) which is pretty horrible, and lots of buildings have been damaged. From what I know so far (2 weeks later) 2 buildings in the CBD have to be demolished because they’re too unsafe to work in now. So it was pretty eventful when we came back to Wellington! If you have any questions about Taupo, or New Zealand in general feel free to ask in the comments below.